When Dunja asked me to review Hanson’s new album Shout It Out, I was honestly a little taken aback. I remember when the band gave a free concert at our (kind of) alma mater the University of Arizona in conjunction with Tom’s Shoes. It was in the middle of the day and I couldn’t make it, but one of my best friends skipped class and had nothing but good things to say. I think it got a lot of hipsters to check out how the band has progressed in the past ten years, so I guess that’s cool. 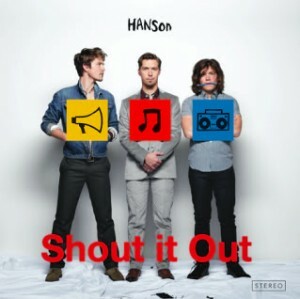 Shout It Out was released June 8, 2010.I had all these preconceived notions about what to expect from Shout It Out, but I decided I couldn’t be that judgmental because from what my thirteen-year-old self remembered, Hanson was a pretty solid group of musicians. After giving it just one continuous go-through, I forced the songs I liked most upon my coworkers. The same semi-whiney vocals, piano-driven beats and uncanny harmonization that are yes, even on “Mmmbop”, still rule Hanson’s musical style. But the boys have clearly grown up. There is much more of a rock feeling on this album and while I think a lot of it sounds like something The Rocket Summer might have made three years ago, there are several standout tracks. “Carry You There” is a rollercoaster of a song that gets so amped up at times that it recalls early Bruce Springsteen. The next track I liked was “Make it Out Alive” because the saxophone featured on the song gave it a jazzy element that I was definitely not expecting from the band of brothers. It’s got a fun tempo and can-do attitude that makes me like it in the same way I do Rooney’s “When Did Your Heart Go Missing”. Hanson slows it down with “Me Myself & I”, which beautifully showcases their harmonization and Taylor’s piano skills, but it’s a little too sappy for my liking. Youngest brother Zac leads the next two songs, “And I Waited” and “Musical Ride” and again on the slower “Use Me Up”. I must admit that whether it’s on a piano-rocker or slow jam, I’m more partial to his voice than that of his brothers’. The rest of the album generally sounds the same. All in all, Shout It Out is a great, positive album that sounds like something that three confident, talented men, not boys, made. Hanson also gets bonus points for releasing the album on their own label, 3CG. It could just be my personal preference, but this album doesn’t have the “wow” factor that defines good and great pop music. It’s clear that the songs have been produced well and are each extremely thought-out and arranged accordingly, but there’s nothing unique, except that this is yet another comeback attempt from one of the highest-grossing acts of my growing up. I don’t – and truthfully can’t – give them a bad review. Even in comparison to the other albums I’ve done for lip though, it’s clear that Shout It Out won’t give Hanson the oomph they need to reenter the mainstream. I’m just not sure I can fully commit to my liking of the album, although I’ve listened to it probably twenty times since the first time. Hanson has both the ability and ambition to be more than average pop music, and I truly believe they’re more than halfway there with Shout It Out. I think they still have a while to go before totally shaking the “Mmmbop” image, but I’ll stick around long enough to see how that develops. I believe in Hanson. You should too. This entry was posted in Arts, Culture, Music, Opinion and tagged hanson, hanson grew up, shout it out. Bookmark the permalink.